So I had to celebrate today with a selfie for sure! This is me after finishing my half-marathon. I hadn't run one in a couple months. 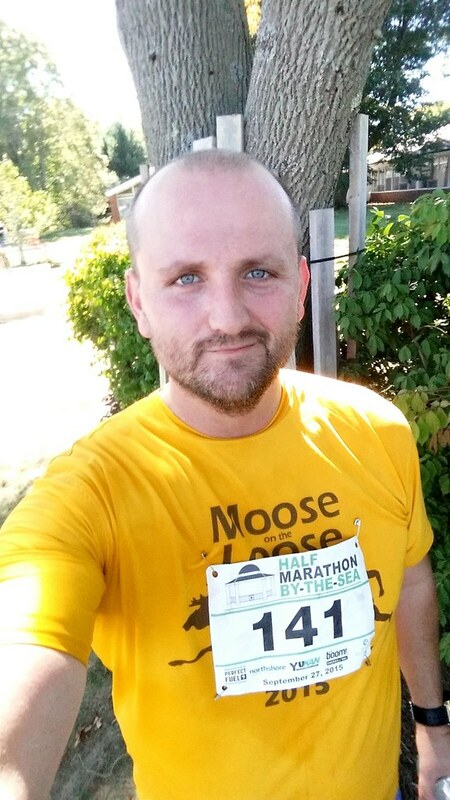 In fact, I haven't done a half-marathon since April when I ran the Moose on the Loose half (the tech shirt I'm wearing in this picture). I came in somewhere just under 2:10 if I remember correctly, but am too lazy to check. I had other races that I was signed up for but accidentally missed a few and was out for one with a hip-injury. In fact, I had and was recovering from said hip injury throughout much of July and August, which was why I was so surprised to do as solid as I did today. I came in at 1:55:08, breaking for the first time the 2 hour mark (which just happened to be one of my goals for the year--YAY!). I was very proud of my accomplishment today. I've been trying to get under the two hour mark for two years now and even though I hadn't ran anything near or under 2 hours prior to today, I just decided to take the run as hard and steady as I can. This meant that I maintained a healthy 8:30 mile for the first seven miles and then slowly drifted but still kept in the lower nines for the rest of the run. It's probably the first real long run where I tried to push myself fast and maintain it throughout. I've done speed runs for under six miles, but I actually managed to do seven miles in under an hour, which is something I've also never done before. Anyways, all of this is to say that today's selfie is dedication to my accomplishment. Feeling quite proud today!